We're always delighted to encounter new web sites that offer ideas on how best to enjoy London. So we'd like to nudge your attentions over to The Nudge, a stylish city guide that works a little differently from the many other options out there. Rather than attempting to be comprehensive or even prolific, The Nudge picks just three or four things each week that the discerning Londoner might find interesting. Falling under the categories of London restaurants, Lifestyle, London Bars, Travel and London Entertainment, each article is written with flair and insight rather than bashed out from a press release. Perhaps the best way to enjoy their content is to sign up for the email alerts, which appear every time there's a new article (i.e. every two or three days). These also offer access to member offers and discounts. 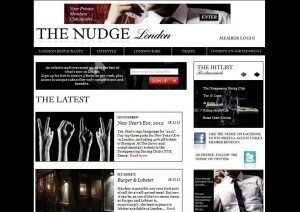 You can also follow the site on Facebook and Twitter (@TheNudgeLondon).